My wife introduced me to horror films one afternoon when she suggested we rent out Clive Barker’s Hellraiser. That film has since become one of my favourites and even now, <cough> years later, we’re still drawn to horror films. So, it was inevitable that we’d go to see the Evil Dead remake. Let’s get something straight right from the start. There are no plot surprises in this film. 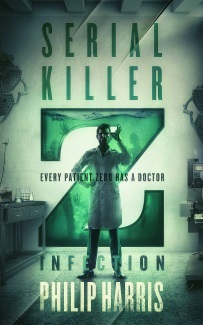 This is the type of horror film that The Cabin in the Woods skewered so beautifully. There was some attempt at a credible explanation for why our protagonists don’t run from the cabin (which given the amount of rain in this film is located somewhere near Vancouver) at the first sign of trouble but beyond that you get all the requisite plot holes and dumb decisions you would expect. But that’s not why people watch Evil Dead and the remake has updated the story without losing the flavour of the original. Which makes it a very gory film. Very. Despite being labelled on the Cineplex website as a “thriller” this is not a watered down PG-13 teen-horror. This is a full on, in your face, R-rated, blood soaked horror film – apparently two full 50,000 gallon tankers worth of blood in fact. 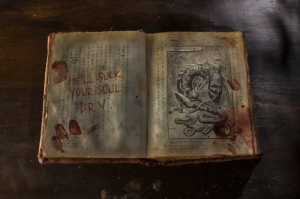 All the requisite Evil Dead imagery is there – the evil book, amorous undergrowth, the trapdoor, gruesome decapitations, a shotgun, the chainsaw of course and lots and lots of blood. I rewatched The Evil Dead at Christmas a while ago and I’d forgotten how much blood there is in the original. Clearly the writers of the new version have not. They do steer clear of the original dialog though – we’ll have no “dead by dawn” or “boomsticks” here, thank you very much. So, nothing that’s going to stretch your brain cells but definitely an Evil Dead movie. Oh, and if you’re a fan of the series stay right until the end – after all of the credits have finished – even the weird logos.